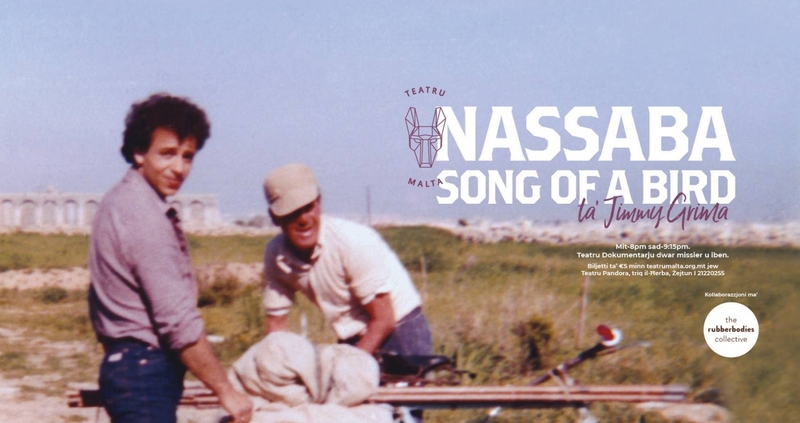 In NASSABA: SONG OF A BIRD, Jimmy Grima follows his father, who is a bird-trapper, to the fields as he did as a child, but this time with a camera. In a one-hour performance, Jimmy documents and unravels the world, the sentiments and the arts of his father and his peers, who know how to whistle and call like singing birds. F’NASSABA: SONG OF A BIRD, Jimmy Grima jdur wara missieru, li hu nassab, fl-għelieqi bħalma kien jagħmel meta kien tifel, imma din id-darba bil-camera f’idu. Fi produzzjoni ta’ siegħa, Jimmy jiddokumenta u jikxef id-dinja, is-sentimenti u l-ħiliet ta’ missieru u sħabu, li jafu jsaffru bħall-għasafar tal-għana.